Since the advent of the Indigenous People of Biafra (IPOB) led by Mazi Nnamdi Kanu, the federal government of Nigeria under the control of the Northern cabals, has wittingly or unwittingly shown their desperation to curb the activities of IPOB. For the political class in Nigeria, IPOB, championing the liberation of the Biafran people, is like a cog in the wheel of their political progress. Their political progress in this context only means oppressing their subjects. In the Federal Government’s unequalled attempt to clampdown the rocket-fuelled growth of IPOB, had in the recent past indulged in the creation and sponsorship of fake groups with fake leaders on the pages of newspapers, to look like they have taken control of IPOB in order to deceive gullible and unsuspecting public. The Nigerian government had purchased a satellite company carrying the Radio Biafra signal in order to obstruct its flow of message in Biafraland and other parts of Nigeria. But unfortunately, all these attempts proved abortive given to the resoluteness and high technicality of IPOB. IPOB has become an organization with a great name in the world. Before you engage in anything that would subdue her, you must have to kill her first or else you would end up shooting yourself on the leg. Read Also: The Selective "Stop and Search" Order on Biafrans at Nigerian Airports, A Quick Reminder That Biafrans.. But here is an opportunity for the federal government of Nigeria to sink IPOB once and for all. 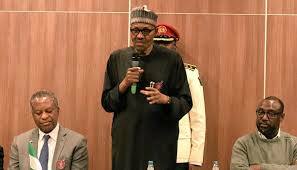 Following the overwhelming evidences provided by the IPOB leader concerning the claim of a possible body double of President Muhammadu Buhari who was reportedly replaced by a Sudanese man identified as Jubril Aminu Al’Sudani, what Buhari only needs to do, in order to clear the doubts, is to come forward to dispute those claims making round the news by doing exactly those things he was challenged to do. Of course, silence is golden. The president is believed to be dead and buried in far away Saudi Arabia many months ago. Kanu provided strong evidences like the ears of the body double not looking the same with the real Buhari personality, the president is now shorter, can’t speak his indigenous language called Fulfude, the president had bald hair but the body double has full hair growth, Jubril is writing with the left hand while the real president writes with his right hand, and so on. Moreover, the issue of the president not appearing close to the people, no longer granting live press interviews, dodging international gathering of the presidents of the world, the sick president now much younger than his real age and healthier that he no longer attend medical check-ups as usual are quite enough reasons to believe that the president is really dead.